Alzheimer’s Disease progresses over time. 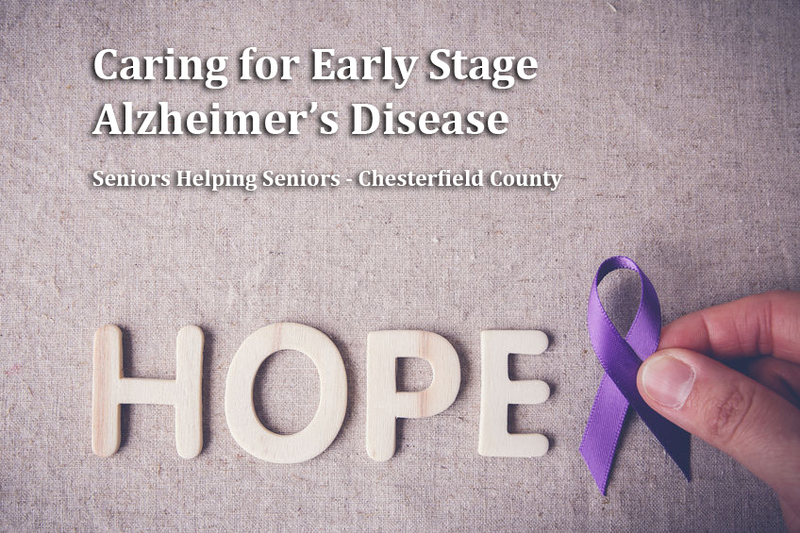 Some signs of early stage Alzheimer’s are: memory loss, difficulty learning new things, difficulty handling problems and difficulty following conversations. A person in the early stages of the disease is generally able to function somewhat independently. He or she can bathe him or herself and may still be able to drive a car. You may, however, need to provide limited care for an early stage Alzheimer’s patents. The early stage of Alzheimer’s can last for years. A diagnosis of early stage Alzheimer’s disease doesn’t just affect those with the disease; it affects everyone who loves and cares about them. Here are some tips on caring for someone with early stage Alzheimer’s disease. When caring for an early stage Alzheimer’s patient, you need to form a solid foundation. A key part of that process is finding a support group. Most cities have some form of a support network for Alzheimer’s caregiver. The Alzheimer’s Association has a search feature that helps you locate a support group near you. When providing care, you need to consider your role. You are a care provider. You are not the person’s boss or guardian, especially in the early stages of the disease. You need to find ways that let the person function in the most independent manner possible, but at the same time, you must make safety the primary goal. You do not want the person to harm him or herself. Rather, you want to provide meaningful care that respects the dignity of the individual receiving the care. As a care provider, you need to find ways to reduce stress on the patient. You can identify tasks that the person can easily accomplish. For example, you might need to do the shopping for the individual due to memory loss, but you can still involve the person in the creation of a menu. It is a task that the person can accomplish, and it reduces stress. The person will not struggle with a shopping list in a store. Alzheimer’s disease can be stressful, and it’s easy to focus on the negative. You can dwell on the loss of memory or the decline in the number of tasks the individual can accomplish. Instead, you need to look at the happiness the individual expresses when seeing a relative or eating a meal. 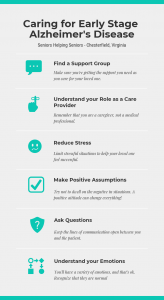 The positive parts of being a caregiver will bring you reward and satisfaction. The negative aspects of the job will only hurt your ability to provide meaningful care. You can’t make assumptions about the type of care the individual needs. You need to have a conversation with the patient and ask meaningful questions. If the person is honest, he or she will let you know what tasks will help and how you can be valuable as a caregiver. You don’t want to talk down to the person. You want to engage in dialogue. That will benefit you as the caregiver and the one receiving the care. Keep in mind that the person with Alzheimer's may not be able to communicate their needs properly or find the right words. Therefore, it's important as a caregiver to watch for signs to determine what they are trying to say and be patient so they don’t feel rushed or not understood. You will experience a variety of emotions as a caregiver for an Alzheimer’s patient — denial, fear, stress, anger and frustration. You are allowed to experience these emotions, but you can’t let them impact your ability as a caregiver. You need to listen to these emotions and understand the reason that they occur. 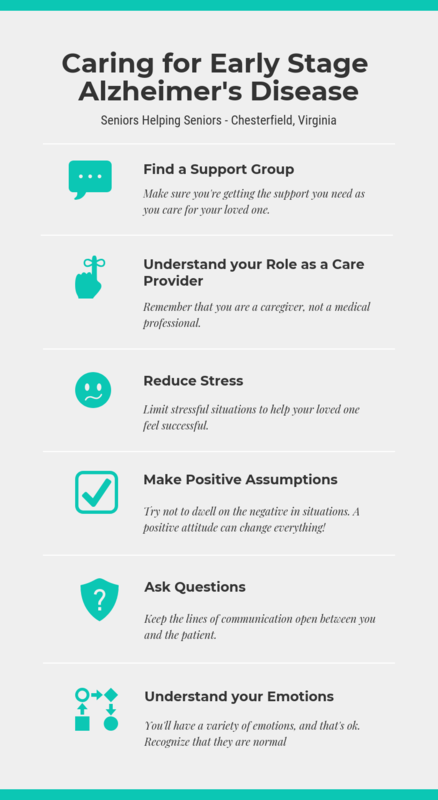 You can find ways to confront the emotions and make the caregiving experience more positive. That might mean adjusting how you interact with the patient or providing support in different ways.